Fans of Deep End of the Ocean and Good Grief will be transfixed by this stunning debut about family, forgiveness, and the struggle to find hope in healing. Life Without Summer deftly weaves together the lives of Tessa, a young mother who has just lost her four-year-old daughter in a hit and run accident outside her preschool, and Celia, the grief counselor who tries to help her put her life back together. Once the picture of domestic bliss, Tessa now grapples with the terrible emptiness left by her daughter’s absence, made worse by police insistence that the case is unsolvable. As Celia struggles to keep Tessa from getting caught up in a bleak crusade for answers, she finds that their sessions open the door to emotions she’s spent years ignoring, forcing her to face the rising tensions in her own life– her troubled teenage son, her alcoholic ex-husband, and her fragile new marriage. Celia soon finds that she must come to terms with the tragic mistakes of her own past and the choices that have led her family to the brink of destruction. Told in two voices, this novel is a haunting portrait of two women whose lives begin to converge unexpectedly when the answers one needs turns out to be the others only chance for peace. 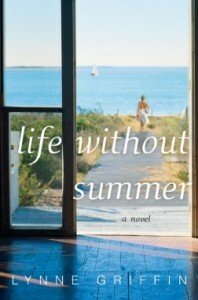 Life Without Summer illuminates what can happen to one’s self-identity and love relationships in the wake of tragedy. Each woman’s intensely personal journey reverberates universal themes about the connections between love and marriage and truth and forgiveness, which no reader will forget. Left with a stirring last vision of four-year-old daughter Abby, backpack slung over her shoulder “so wide her little head of curls stuck up like a turtle’s out of its shell,” magazine writer Tessa experiences nearparalysis caused by shock and grief in the days noted in her journal following the hit-and-run that claimed Abby. The bereaved mother starts counseling with Celia, a therapist Tessa first sees as so stiff and icy she finds herself questioning whether or not she can, or even wants to, be helped by one whose responses seem rote. Interspersed with Tessa’s journal entries and entwining the women’s lives in this stirringly believable epistolary novel are Celia’s own intimate journal entries revealing startling challenges. Winter passes, leading at last to new hope and life as Abby’s killer is surprisingly revealed and the two women, sharing ” an unending connection,” bond in an unexpected way. Griffin’s strong addition to women’s fiction should be in demand.